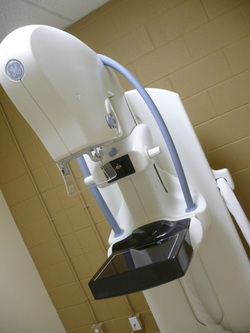 Waterloo Nuclear and Radiography now offers Mammography on a top-of-the-line, FULL FIELD DIGITAL GE unit! Patients can now benefit from being imaged on the best DR technology equipment with less radiation exposure, all at the convenience of a clinic. This means that mammograms can be done faster. Curbside parking is available and parking is always free. “An independent study led by a Cancer Care Ontario (CCO) lead research scientist examining the technology used for mammography has found that digital direct radiography (DR) and screen film are significantly more effective than computed radiography (CR) at detecting breast cancer. “Screening finds breast cancer earlier, when there are more treatment options and an improved chance of survival.